Ketchum resident Chris Campbell, foreground, rips along under his 12-meter foil kite near Phantom Hill, north of Ketchum, on Sunday. Powered by the wind and patterned after kitesurfing in the water, Kiteboarding or kiteskiing has caught on in winter resort towns. Free of liftlines and ski tickets, this sport offers the freedom that attracts extreme athletes. 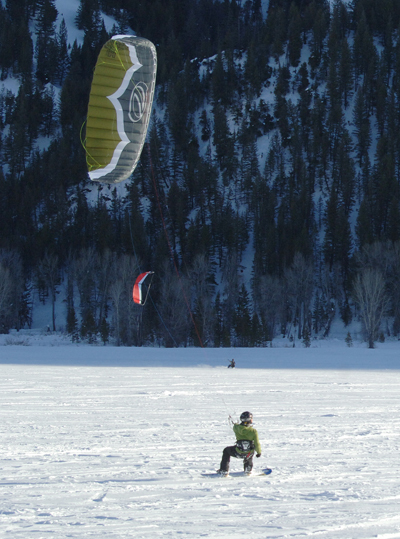 The skier, harnessed to a safety release system connected to lines that control the kite, attempts to "tack" across the terrain keeping the kite full of air. How safe is Quigley for planned 378-home development? Does GOP wish Sarah and 'Joe' would go away?